Wren died at the age of twelve, by three gunshot wounds. One hundred and seventy eight minutes later... She was rebooted. Reboots aren't quite human, the level of human traits and emotions depending on the time between death and the body healing and rebooting. Wren's reboot number indicates her lack of emotion, her willingness to kill without guilt or remorse, and never question orders. Their job is to track down human targets, those dying from disease or who have broken the law. Wren is feared among those in the slums where she carries out her assignments, and her peers. Wren has lost all sense of humanity, until she meets Callum. Callum is a new reboot and the lowest number the facility has seen, twenty two. Surprising, Wren takes it upon herself to save Callum's life, training him to become a soldier. Callum refuses to kill, isn't scared of Wren and smiles at the most inappropriate moments. As Wren finds herself warming to the cute reboot with the twinkling eyes, she knows that Callum will never become the heartless soldier that is expected of him. Wren needs him, she needs him to help her feel alive, to feel human again. The rebels are amassing, hidden throughout the slums, readying to fight the corporation to ensure a world where everyone is equal, human and reboot. Wren finds herself with allies. Her goal is to find shelter within a formed reboot camp. Can she trust humans, when most despise what the reboots represent, death and destruction? Callum is slowly deteriorating. Having been injected with a trial serum, to void reboots of any emotion or human traits. The serum leads to a reboot shutting down, becoming wild and animalistic. Seeing humans and fellow reboots as food. Callum will die without the antidote, there isn't a choice. Wren needs to go back, or at least she'll die trying... Again. Reboot began telling the story of Wren, with no personality, no emotions. Luckily, Callum is introduced within the first few chapters and brings the story to life. From there on, it was incredibly entertaining and action packed. More dystopian than science fiction, but just enough to keep the story interesting... And no cliffhanger, as seems the standard with most young adult series' nowadays. A dystopian young adult, with a little romance, rebellion and science fiction, I'll be eagerly awaiting the next in the series. Hi Dani and thanks for popping by. Very cool blog, have joined now too. 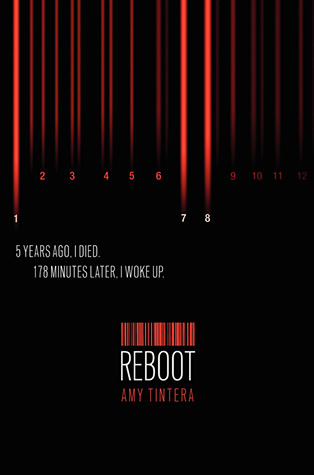 Reboot is just one of a whole heap of awesome dystopian science fiction young adult coming out at the moment. It reminded me of Legend by Marie Lu. Thanks for your review Kelly, I'm reading this at the moment and just not getting all the hype about it! I find Wren to be boring, emotionless and inconsistent and the chemistry between to two to be quite forced. Oh well! I think it's one of those titles that you'll either love it or loathe it. I didn't particularly like Wren either, so you're not alone with that one. Hopefully it picks up a bit more for you. Thanks for popping in Jeann.